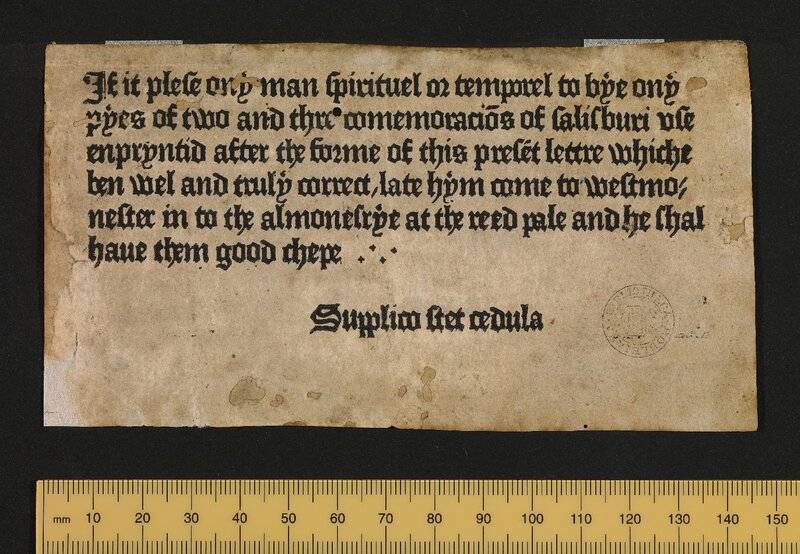 A two-sided page from a 15th century priest handbook printed by William Caxton has been discovered in archives of the University of Reading. Written in Medieval Latin, the leaf was part of a book called the Sarum Ordinal or Sarum Pye, a manual for priests on managing feast days for English saints during the ecclesiastical year. It was printed by William Caxton in his shop, the Red Pale, in late 1476 or early 1477 and was one of the first books printed in England. The University of Oxford’s Bodleian Library has a notice from Caxton’s shop promoting the manual which is the earliest surviving printed advertisement in English publishing history. One of only two known surviving fragments from this enormously significant edition in the history of English publishing, the leaf is in very good condition even though it hasn’t exactly been treated with kid gloves over the years. For three centuries it was glued into the spine of another book to reinforce the binding. It was saved from that ignominy by a University of Cambridge librarian in 1820 who put it in a scrapbook along with other fragments rescued from bindings, but not even he recognized it as an original Caxton page. University of Reading Special Collections librarian Erika Delbecque, on the other hand, knew right away she had struck gold. The pages are part of the John and Griselda Lewis Collection. John Lewis was a typographer and pioneering scholar in the field of printed ephemera. Griselda was a writer. Between them, they amassed a collection of more than 20,000 items pertaining to the history of printing. The University bought the John Lewis Printing Collection at auction in 1997 for £70,000 ($90,000), with the aid of a £60,000 grant from the Heritage Lottery Fund. The collection is stored in 87 boxes at the University of Reading’s Centre for Ephemera Studies in the Department of Typography & Graphic Communication. The collection is still in the process of being catalogued, which is what Erika Delbecque was doing when she came across the Caxton leaf. Copies of the Sarum Ordinal were produced in Westminster, before the Reformation, and consisted of around 160 leaves. The text was originally established as a manuscript by St Osmund, the Bishop of Salisbury, in the 11th century. It would have been owned by clergymen and consulted on a regular basis, but was discarded after the Reformation. 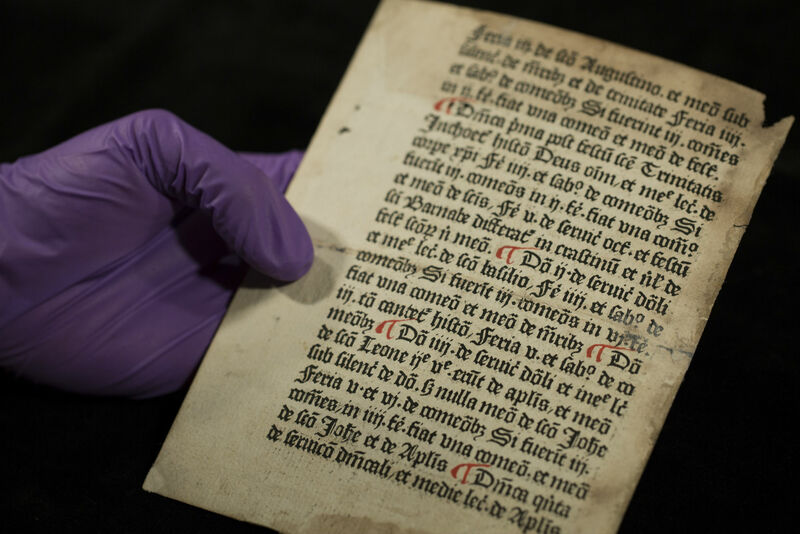 Only one other surviving fragment of the book exists, consisting of eight double-sided leaves, which are held at the British Library in London. The University of Reading’s leaf is from a different part of the book than the British Library’s pages, so it is unique. 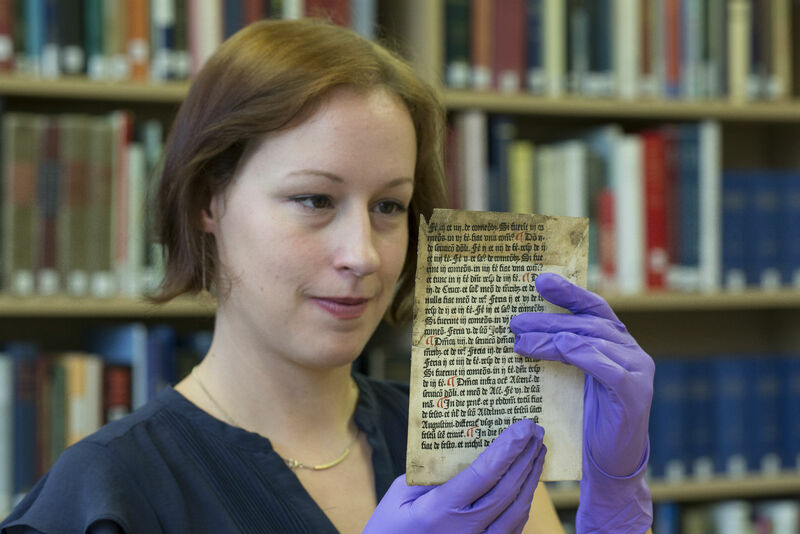 The Caxton leaf is on display at the University’s Special Collections department at the Museum of English Rural Life on London Road through the end of the month. Admission is free.